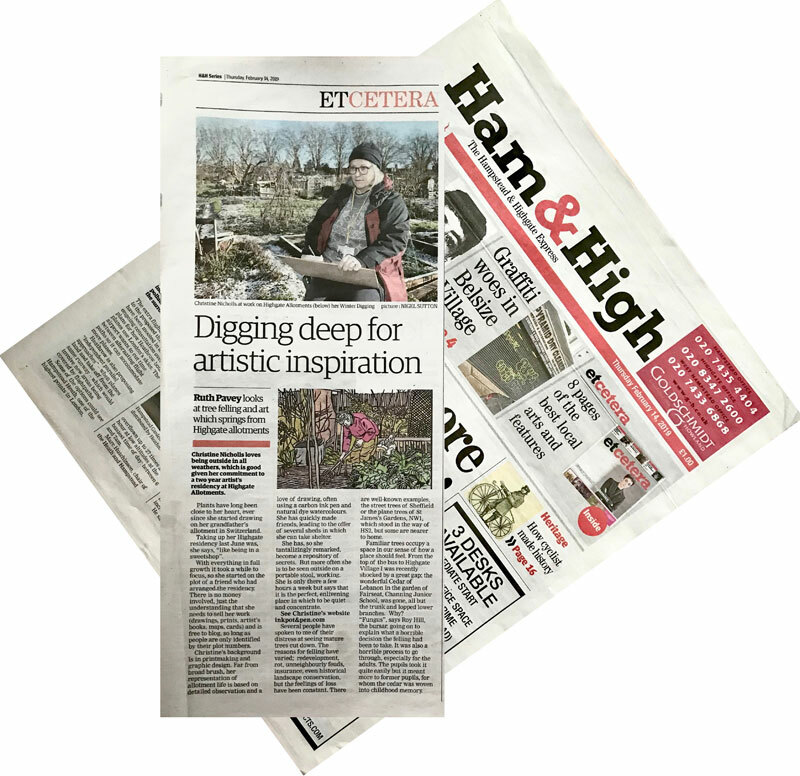 An article in the gardening section of the Ham & High Express. The online version can be read here. SussexEveryDay is a new initiative celebrating inspiring people with connections to Sussex. A great article in one of the London Belongs to Me family of papers; The KentishTowner. You can read the online article ‘OMG, Look at this map of Tufnell Park’. I am running two bookbinding workshops before my Fold-Out Pop-Up Shop opens on Saturday 10th (Children 11 years old and above) and Sunday 11th November (Grown Ups), from 10:00am to 11:30pm. Both workshops take place at the Ruby Violet event space, in Tufnell Park, North London NW5 2HL. Spaces are limited and booking is essential, which can be done here. November 9th, 10th and 11th I shall be having a Fold-Out Pop-Up shop in Tufnell Park North London. I hope you can pop in and say hello! I am exhibiting and selling my artist’s books at this autumn’s Ink, Paper + Print fair in Eastbourne on 13th and 14th October. There’s an impressive array of talent that will be exhibiting with me and some great talks happening over the weekend, so do come along and say hello. I'm running one of my Mapping Your World workshops on Saturday 16th September 2018 in Deptford... details are below. Visual artist Chrissie Nicholls- Inkpotandpen will be leading a walking workshop encouraging people to look-up, take notice and appreciate the detail in the neighbourhood as she leads people through the streets of Deptford taking in the sites on her ‘Mapping Deptford’ walking tour on Sunday 16th September 1-6pm. Adults (16+) £15 (including materials/book). NEWS SPLASH! Prints in a summer show. I have five of my prints and a Version 2 of my Tufnell Park map, along with 20+ other artists who are local to Tufnell Park, at the Bronwen Whitaker Summer Show on Wednesday 5th September 2018 7 to 10pm. Bronwen Whitaker Picture Framers are teaming up with restaurant and bar Korova with a 20% discount on their ‘A Le Carte’ menu and a selection of delicious cocktails. This is the time of year when the Inkpot & Pen Press gets particularly busy, creating new books, going to book fairs and pop ups. I shall be exhibiting at the Anna Lovell Jewellery Pop Up Shop in Shoreditch on 8th, 9th and 10th June. Along with Anna I'll be with Lagar de Senora organic olive oil and wines and Hackney Honey. I can vouch for both of these products having tried them many times! We'll also be selling ceramics and cards, but the thing that draws most people in is that we'll have twiglets! This weekend I was at the wonderful Turn the Page Artists Book Fair in the Forum in Norwich. It's such a friendly fair and I always meet such interesting visitors and book artists. My map of Norwich went down very well, so I'll be fulfilling the orders for this during the week. Soon the Tittle Tattle of Tufnell Park and Noodling in Norwich maps will be on the site for you all to see. Dates for next year's Turn the Page 2019 are May 17th and 18th, put it in your diary now! I shall be delivering a talk for the NLLA (North London Lettering Association) on 17th April 2018. The talk called ‘Earth on my Hands and Ink on my Fingers’ and will be about my journey. It will cover the early stages of my life and career to becoming a full time creative. The moment of breaking away from the security of a regular paid income and the highs and lows, mistakes and successes, that have led me to where I am now, with particular attention to lettering and the Inkpot & Pen Press. If you would like to come along to this talk, it’s only £4 entry to non members. I was recently asked to provide a demonstration for the Society of Bookbinders Book Arts Day 2018. The starting point was what to demonstrate. I work in a number of disciplines, both in my commercial work and my own work, but my book arts were obviously more relevant here. This was my workspace at the Book Arts Day. My artists’ books were on display on the right of the table (out of shot) and the section on the left (in shot) was my demonstration space. You can see that I covered the table with brown kraft paper which I then drew and wrote on and also asked people to write on, if they wanted to be added to the mailing list. I used the cupboard behind my table to put up finished pages and my timetable - which I added to as the day progressed. And then I hit on the idea of a ‘living’ or ‘live’ journal. My sketchbooks are a mess of ideas and drawings, lists and notes, but my holiday sketchbooks are usually an A5 concertina format, (Seawhites concertina sketchbooks with their lovely protective box are my favourites,) and tell a story. Walking from one end of the holiday through my experiences to the other end. Sometimes they are just visual, other times they are full of writing, sometimes personal, about the distinct lack of chocolate or how Mr Inkpot has yet again fallen asleep in front of the fire while doing his crossword… It’s a journey from the beginning to the end of the holiday. The Book Arts Day was held in the Congregational Church, Kelly Street in Kentish Town, so the location and surrounding area is one I knew well, the idea started to form that I would make a journal on the day throughout the event, documenting what the day meant to me. Some preparation work and pages were worked on beforehand. The map to venue for example, the drawing of the venue’s exterior (see below), which as it turned out was the rear of the building, but was more interesting anyway! This concertina map, of the route from my home to the venue, with illustrations of things that caught my attention on the way, from lettering to lampposts, buildings to bus stops. Some pages were partly done, set up so that they could be added to on the day, for example my timetable for the day and the page for overheard conversations. My ‘To Take’ list is made with two sheets of squared paper woven together with a thin slice of Gmund Bier paper, made with hops, malt and cellulose. Cut so the top section of the page could be bound into the book leaving the bottom section free to open out. Another list format was my ‘Timetable’ page, or what I’d planned to do… and what I actually managed to do! Then some pages were left to be created almost from scratch, the pages were precut to size and drilled for binding and some pockets were pre made. Like the venue’s interior drawing and the ‘Layers of Sound’ pages. Three tracing paper sheets overlaid with lettering on each page to give the impression of sound weaving its way into spaces, uninvited. I wanted to create a unique very personal response to the day, but there also had to be something for my audience to participate in, so that they joined me and became part of the book. There are more examples of the different pages below along with details of the paper and binding techniques used. I hope you enjoy walking through the book, doing this demonstration and making the book was a great experience for me. I met so many lovely people on the day from individuals to two of my hero bookshops which I absolutely must tell you about. The weather page was pre drawn with squares to fill in on the day. I wasn’t expecting it to snow though, so I had to adapt the page. Unfortunately I was so busy talking I didn’t remember to ask everyone to sign the Visitors page. The receipts are tucked into their own pocket. Tanya Peixoto runs Book Arts Bookshop Hoxton, East London. A small space packed with interesting and exciting artist books, it’s also a place for discussions and events, so well worth a visit. The opening hours are quite specific so check the Contact & Location page on their website. This is a bookshop with a difference, they sell new and old books, alongside their own Re-covered Notebooks, it’s a haven for book lovers with comfortable chairs and it’s the first bookshop that I went into that had spare reading glasses if you’d forgotten your own. It’s a bookshop for the visitor, everything about it is set up for you to enjoy your experience. They have Propero’s Projects which are their social enterprise projects and they have an envious staircase that every bookie person will want to take away! I hope you enjoy looking at the video and pages, if you have any questions about the book please drop me a line and I’ll try to answer. I’m currently in discussion regarding running some journal workshops later in the year, so if you’re interested nip over to the Contact & Signup page and subscribe to the mailing list as this is where things will be announced. Inside front cover are small envelopes joined together in a concertina which holds business cards from exhibitors and a thank you to all the helpers and volunteers on the day. Front cover of book board. Thank you to Klara Vith for donating her lovely business card that had to go on the front. First ideas and development drawings. A3 layout sheets, glued onto strips of kraft paper which are drilled and bound into the book. This fold out page all relates to the 17th March, the date of the Book Arts Day. With newspaper cuttings from the Guardian’s 17th March 2018 edition along with history dates relating to 17th March. 17 March 1845 / Henry Jones in Bath patents self raising flour. 17 March 1905 / Eleanor & Franklin D Roosevelt married. 17 March 1957 / Dutch ban on Sunday driving lifted. A journal note page, not enough time on the day to write a full journal entry. Sketches are held in a ‘dos-à-dos’ (back to back) pamphlet binding sewn in to the book. Some sketches were done very quickly, others more considered. This shows the dos-à-dos pamphlet bound into the book. A watercolour of the back of the venue building. A drawing of the inside of the event room, folded using a Turkish Map Fold into the book. Overheard conversations, the only problem being on the day I talked to so many people during the event, I didn’t overhear very much! Leaves and flowers collected on the day during the walk to the venue... in the snow. A small pamphlet made of blotting paper sewn on the right. Small drawings on tissue paper of different tools used on the day. Colours and patterns seen in the venue on the day including a lipstick sample. A tricky binding where the 4 page booklet is sewn into a sleeve which is then bound, allowing the booklet to fully open. A pocket made with tracing paper and attached to a black backing sheet. Different emotions experienced on the day are written on strips of tracing paper. As the book is opened and closed the strips of paper move around in the pocket different ones coming to the fore, reflecting how my feelings changed during the event. I asked people to write their secret dreams on pieces of black paper so they could be permanently bound into the book. The dreams have started their journey to becoming reality. Happily being ‘incubated’ in the pocket, as one of the visitors described it. The pocket is sealed with sealing wax and also bound into the book to prevent it being opened. The word Secrets has been written and then embossing powder melted over to give the raised text. A stiff pocket made to hold various pieces of ephemera collected on the day. Pages are bound into a book using Japanese stab binding. The final page made of a folded sheet of red card, bound to the other pages and then attached onto the back cover. This is a Swiss Binding, where the front cover and spine aren’t attached to the body of the book. I am taking part in the Fabrica fundraising Draw-a-thon on 24th February 2018 and am asking if you would like to support me by donating to my JustGiving page here. Fabrica opened its doors in March 1996 in the deconsecrated Holy Trinity Church sited at 40 Duke Street, Brighton, BN1 1AG. It commissions contemporary visual art installations specific to the building. A place where artists come to make work, Fabrica supports and encourages artists to be adventurous and test boundaries. Open dialogue between artists and visitors is encouraged and the gallery provides an integrated programme of education and audience development activity. This strives to remove barriers to access, engagement and understanding. Fabrica works with many vulnerable and isolated people in Brighton and thousands of people are able to see the most up to date contemporary art, because entry is free. You can read more about the core six strands that define Fabrica here. On Saturday 24th February 2018, Fabrica will be hosting a Draw-a-thon and Writing Relay. You can come and watch this non-stop stream of drawings unfurl throughout the day and read new stories as they emerge on screen. The event starts at 11am and ends at 4pm. “Individual artists or artist teams will draw for five hours non-stop. I will be drawing for five hours and like all the artists participating, I’ll be using graphite and graphite pencils only, drawing on cartridge paper. There will also be a a public drawing wall, background music and refreshments for sale and CAKES! So come and say hello and join in too if you’d like to. I studied at Brighton Polytechnic 1984 to 1987 and continued to live in Sussex for a number of years after my degree (in Fine Art/Printmaking). During this time I had a studio at Red Herring studios. I met and made friends with many wonderful artists and craftspeople at Red Herring and through those people met many more.One of the artists all those years ago was Matthew Miller. Matthew became a good friend and we lived in a shared house (five of us in total with a constant streams of friends visiting and staying) where every Saturday ‘Summer in the City’ would go on the turntable which meant it was time to get up and clean. Strange the memories that stay with us. Matthew was the friend I sat next to on a bean bag during a party and just quietly watched the world going on around us, without needing to speak. But Matthew was big and noisy in his own way. He was one of the founding members of Fabrica along with other artists from Red Herring and he was a co-director along with Liz Whitehead. To me, Matthew was a dear cherished friend. Quietly present in my life although not always physically present. He inspired me every time we met, he encouraged me to think widely about my creative interests and all while I didn’t realise what was going on, until, in 2011, he suddenly died. Seven years on I still mourn the loss of this dear talented friend and am proud to be able to take part in an event that supports a cause that was so much part of Matthew. You can read about Matthew and his talents in his Guardian obituary. Through the years I’ve visited Fabrica many times, been able to immerse myself in art that I otherwise wouldn’t have been able to see and experience. I feel this gallery is a really important part of the current art scene, it supports so many people in so many ways. I feel a need to, and feel privileged to be asked to be part of this team of people helping to, keep Fabrica open. The Draw-a-thon for me is a way to support this wonderful gallery, a way to remember my dear friend, and a way to let people who may not have heard of the gallery, know about Fabrica. If you would like to support me by donating please visit my JustGiving page here. Following our success at Turn the Page artists’ book fair in Norwich back in May, (where we won the book fair prize), Harrington & Squires and Inkpot & Pen Press have decided to put on our own artists' bookfair in Tufnell Park, London called The Corridor Pop-Up Book Squeeze. Along with Mike Nicholson of Ensixteen Editions and Mette Ambeck of Ambeck Design we’ll be opening the doors of Harrington & Squires from Thursday 5th October to Sunday 8th October 2017. We’ll all have work on show, and for sale, with some of these being exciting collaborative projects we’ve worked on, including Inkpot & Pen Press's latest book, 'Holly'. Holly is a collaboration with writer and journalist Sandra Lawrence, who I also worked with on the artists' book, Columbia Road. 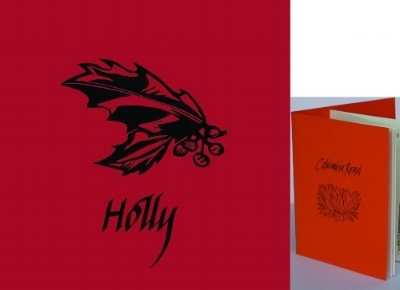 Front Cover Design of the new book 'Holly' from Inkpot & Pen Press, and 'Columbia Road'. I hope you’ll be able to come along and look forward to seeing you. I'm very excited to announce that I will be at Turn the Page 2017 in Norwich with my artists' books. I am sharing a table with the lovely letterpress printers; Harrington and Squires. If you're in Norwich this Friday or Saturday; 25th and 26th May, do come and say hello. We will be at the Forum in Norwich. If you can't make it to Norwich but are in London, I'm showing and selling my books at the Anna Lovell Summer Sale again from Friday 16th June to Sunday 18th June. I shall be at the Sale on Sunday and there are more details on the image below. Anna and I go back to foundations days together, she then went off to study jewellery at Middlesex and I went to off to the seaside at Brighton to study printmaking. Along with Anna's jewellery and my books there will be textiles, ceramics, olive oil and hone, but we all know you just come along for the Sangria and Twiglets! I look forward to seeing you in Norwich or London if you can make it. Hello new website and name! So, this is the first ink blot blog and it's a news splash too! And here I am, a new name for the business: Inkpot & Pen, which ties in nicely with @inkpotandpen which is my instagram and twitter handle. It’s been built by yours truly, with a lot of help on the foundations, and some scaffolding along the way, by my lovely friend Lisa. No doubt I’ll have forgotten a couple of screws here and there so it may take me a while to get over the teething troubles but we’re here. I have lots of plans, this blog page and a monthly newsletter. They’ll have different information on so if you’d like to sign up to the newsletter straight into your in box, once a month or slightly less often, then nip over the the contact & signup page now before you forget. For those of you that have joined me on the migration from Winter Wrote a Letter, hello again, you’ll find some new and some familiar pieces dotted around the site. I really hope you enjoy the new website, let me know, over on that contact & signup page I mentioned earlier. Why not make a brew, sit down and come for a wander around the site.